today with us and he is the head man, I say the head man, the head priest from St. Patrick’s. I think St. Patrick’s could be the oldest Catholic church, is that correct? Monsignor Salvatore Criscuolo:	It is, Andy. It is the first church established in the federal city, goes back to 1794. Andy Ockershausen:	It’s just an incredible history of St. Pat’s. Monsignor Salvatore Criscuolo:	It is. Andy Ockershausen:	It was a celebrity church too, for awhile. A lot of people got married there, but I guess they moved to new parishes and so forth, but I’ve known St. Pat’s … I’m from Northeast Washington. My grandfather was here, he was a baker. I never knew him, but someplace at 5th and G, and I think his parish might have been St. Patrick. Monsignor Salvatore Criscuolo:	5th and G, it probably would have. Andy Ockershausen:	That’s close, isn’t it? Monsignor Salvatore Criscuolo:	Very, very close. Andy Ockershausen:	There wasn’t a lot downtown in those days, and there wasn’t much to downtown. But Sal, we’re so delighted to have you and to talk to you. In addition to your work with the clergy. You are the chaplain for the police and fire departments of the greatest city in the world, Our Town, Washington, DC. Monsignor Salvatore Criscuolo:	I am. I’ve been very blessed for the last 32 years to serve the First Responders in the District of Columbia, as well as some of the federal agencies that are here. Andy Ockershausen:	Do you do work, any county work? Do you help out if they need you? Monsignor Salvatore Criscuolo:	I don’t do anything in the county. There’s enough going on in Our Town. But I work with Metropolitan Police, is when I first came on, back in 1986 as their chaplain and then it’s expanded over the years where I work with Capital Police, the Park Police, Secret Service, do some work with ATF, Alcohol, Tobacco and Firearms. Andy Ockershausen:	You’ve got a lot of people depending on you in bad times. Because that’s when they call for you mostly, in bad times, correct? Andy Ockershausen:	I know that. You’re an entertainer, I know that. Monsignor Salvatore Criscuolo:	… when there’s graduations and when there are promotions. They also call when they want to get married, they call when they want to have their children baptized. So it’s a parish, it’s just it’s a unique parish. Andy Ockershausen:	The whole departments are your parish. Monsignor Salvatore Criscuolo:	Right, right. Andy Ockershausen:	And the same thing with the Fire and Rescue people? Monsignor Salvatore Criscuolo:	Correct, yeah. So it’s an amazing ministry that when I was ordained back in 1978, never thought that I would be doing this kind of ministry. In my first assignment in Takoma Park, the volunteer fire department in Takoma asked me if I would come and be a chaplain to their fire department. Andy Ockershausen:	Did you have a parish out there? Monsignor Salvatore Criscuolo:	I did. I was brand-new, I was newly ordained in 1978 and I was the associate in the parish. Andy Ockershausen:	What was the parish? Monsignor Salvatore Criscuolo:	Our Lady of Sorrows. Monsignor Salvatore Criscuolo:	In Takoma Park. Andy Ockershausen:	We had one of those in Anne Arundel County that Janice and I belonged to. Andy Ockershausen:	Our Lady of Sorrows. And I did that for a few months and then after awhile they said, “Why don’t you ever come down and ride with us?” I said, “Oh, ride on the fire engine.” It’s like every little boy’s dream, even when they’re older, it’s still their dream. Andy Ockershausen:	Here I am. Monsignor Salvatore Criscuolo:	So I started doing that, and they taught me some of the apparatus. I never fought fires, that was not my job, but I did learn how to hook up hoses and be there with them and do runs with them. Andy Ockershausen:	You have to learn it, Father. Monsignor Salvatore Criscuolo:	Exactly. So that’s where it all started, in Takoma Park and then 1986, I became Chaplain to DC. Andy Ockershausen:	Well that was osmosis. I mean, they must have heard about your work out there and they wanted you to work with them and so your popularity spread, Father. Monsignor Salvatore Criscuolo:	It did. I actually thought my popularity was over when I left Takoma Park, because I was stationed in DC. There was a Chaplain in DC that had been chaplain for years and then he asked me to cover for him for a month, and I did. And then about a year later, he asked me if I was interested in coming on as part-time Chaplain. And I said I’d love to, and then it became full time. Andy Ockershausen:	And they were both police and fire at the time? Monsignor Salvatore Criscuolo:	At that time, was police and fire, it was just police and fire we have expanded. Andy Ockershausen:	And now you’ve added almost … I lived through that with Heroes. Because we started out at Heroes, and Bud started in 1964, it was to help DC police and fire. And then it spread, as you know now, where it’s five or six counties and almost half of the population of the East Coast is Heroes, but it all grew from that one beginning. Monsignor Salvatore Criscuolo:	Yeah, the federal agencies, back about 20 years ago, started to expand and ask clergy from different denominations to become chaplains. So the federal agencies have realized they need some support also. Secret Service just brought on 100 chaplains throughout the entire country. Monsignor Salvatore Criscuolo:	Yes, yes. Andy Ockershausen:	Wow. So they’re doing the good work. So that got you involved very deeply in the community and that was your love, that was not your advocation. And I’m going to take a break here now, we’re going to come back and talk about Father Sal and St. Patrick’s and what you have done for Our Town. This is Andy Ockershausen talking to Monsignor. Announcer:	Your listening to Our Town with Andy Ockershausen. Brought to you by Best Bark Communications. Andy Ockershausen:	This is Andy Ockershausen, this is Our Town. I’m having a wonderful conversation and I apologize for calling Monsignor Salvatore by his first name but we know each other. But his name is Criscuolo. Criscuolo? Janice Iacona Ockershausen:	No Criscuolo. Andy Ockershausen:	Criscuolo. There’s a U in there. Monsignor Salvatore Criscuolo:	There is a U but it doesn’t mean you have to use it. Andy Ockershausen:	Criscuolo. It’s silent U.
Monsignor Salvatore Criscuolo:	It’s silent. Andy Ockershausen:	Reverend Monsignor Salvatore Criscuolo is the main Reverend Monsignor of St. Patrick’s Parish as I believe the oldest parish in the city of Washington. Monsignor Salvatore Criscuolo:	It is Andy. Andy Ockershausen:	And had a wonderful wonderful time. And you moved from Takoma Part Downtown? Monsignor Salvatore Criscuolo:	I moved from Takoma Park and then I was sent to Assumption church over on Martin Luther King Avenue in Southeast and then from there our Lady Queen of Peace, Ely Place Southeast, and then I was Saint Ignatius in Oxon Hill, Maryland. Andy Ockershausen:	Oh I know Saint Ignatius. Monsignor Salvatore Criscuolo:	And that’s when I became, that’s when the ministry became full time to law enforcement and all our First Responders. And then after 911, a year later I was ask to possibly move in to the city so that I’d be more available and I did and that’s when I moved into St Patrick’s. Andy Ockershausen:	When did you start on the bikes with the motorcycle? Monsignor Salvatore Criscuolo:	The motorcycle is towards twenty some ideas ago. I actually went down to a Rolling Thunder over twenty years ago. And I drove as Chaplain and I wanted to be out there with the police were out there and give me an opportunity to see them, but I couldn’t get through the streets. All the streets were blocked off with couple of hundred thousand motorcycles. Andy Ockershausen:	What academy did you? Monsignor Salvatore Criscuolo:	At the Police Academy. At Metropolitan Police Academy over by Blue Plains. So my first day of riding was on the 4th of July of that year and Chief Fred Thomas saw me on the scooter. It was a 250 at that point. And he looked at me and said, what are you doing on this? And I said Chief, I took the course and I have a license with your name on it. Monsignor Salvatore Criscuolo:	That was the 4th of July and the 5th of July I was called in to the police department by an Assistant Chief who said your grounded. And he said the Chief feels it’s too dangerous. So I let a couple of days go by and I spoke to Chief Thomas and he said..
Andy Ockershausen:	I remember him, Chief Thomas. Monsignor Salvatore Criscuolo:	I really would like to do this and he said, it’s never been done. And I think that was the problem it’s never been done. Andy Ockershausen:	Right it’s a trail blazer.. I said that. You are a trail blazer. Monsignor Salvatore Criscuolo:	I didn’t know I was doing that but I guess I did. And he gave me permission and it’s been that way ever since and then the police were giving me grief because I was riding a little 250. And they were riding Harleys, and they said I needed to learn how to ride a Harley or they won’t let me ride with them. And I learned how to ride a Harley and I have been riding a Harley now ever since. Monsignor Salvatore Criscuolo:	They do. They’re very supportive and it gives me an opportunity to get out there doing the parades, demonstrations, just to be out there with the men and women. Andy Ockershausen:	To get to see all the guys and the people you work with. Monsignor Salvatore Criscuolo:	Exactly it’s important. It’s important to be out there. Monsignor Salvatore Criscuolo:	Oh yeah I ride in the parade with them. Andy Ockershausen: I’ll have to look for you now. Monsignor Salvatore Criscuolo: Well they all come down in that V, and they put me in the middle so I’m not messing up the V.
Andy Ockershausen: Protect each other. Monsignor Salvatore Criscuolo: So Fourth of July, Memorial Day they’re very accommodating and I think they get the kick out of their Chaplain riding with them also. Andy Ockershausen: I believe it. How about the fire guys? You show up at fires of course. Monsignor Salvatore Criscuolo: Not as often as I used to. They have another Chaplain that they brought on a few years back and I still get involved somewhat with them. But, and if they need me they have my number and they will call. But they now have a group of firefighters who are Chaplains. And when I became a pastor of St Patrick’s in 2004, the time became more and more limited as for me being able to get out. Andy Ockershausen: Well it’s such an important post, St Patrick to my way of thinking I know .. I know what St Pat’s means in Our Town and that’s been a wonderful experience for you of course to be there. Monsignor Salvatore Criscuolo: It’s been an amazing experience and to this day, I have been there since 2004. I will work around in the church every so often by myself and I look around and I look after the heavens, and I say to the good Lord I still can’t believe you put me in charge of this. So he has a great sense of humor. But it really is a historic parish, it’s a very important parish, for downtown. Andy Ockershausen: Absolutely, Our Town. Andy Ockershausen: Visitors visitors visitors! Andy Ockershausen: What did I do wrong??? Andy Ockershausen: But that’s a great feeling though to know that. Monsignor Salvatore Criscuolo: It is. It really is. The history of the parish became even more historical three years ago when Pope Francis came to visit us. Andy Ockershausen: Well I remarked on that and we were so happy that he came to Washington and he went to St Patrick’s, which means a lot to Our Town because that is in the middle of Our Town. It was world wide covered and I know you were deeply involved to have him in your flock that day. Monsignor Salvatore Criscuolo: It was quite an experience. From March when I received the phone call, that he would be coming. When the auxiliary bishop called he said that the Holy Father is probably gonna stop at St Patrick’s, but at this point you can’t say anything. And I said this is worse than confession. I don’t have any problem keeping those secret but the Holy Father is coming to St Patrick’s and I can’t say anything. But the Secret Service started showing up. And they came three or four times. In March and April and the staff started wondering why they were coming. Andy Ockershausen: Who planned the luncheon for the Catholic Charities? Monsignor Salvatore Criscuolo: That was Catholic Charities that planned that..
Andy Ockershausen: And that was a great event too ‘cus it got on television. Monsignor Salvatore Criscuolo: Then he left here, went to New York and then to Philadelphia and his schedule was just as hectic and busy. Andy Ockershausen: But to have him in Our Town was such a blessing in a lot of ways and the publicity and so forth, I know the Catholic Charities was a great event. They sat down to have lunch. As soon as the Pope arrived the lunch was over they crowded around him. I loved it. Monsignor Salvatore Criscuolo: He came out the door at Catholic Charities and blessed the food and people were suppose to sit down and eat but they didn’t wanna sit down and eat. They wanted to see the Holy Father. That’s the way he is. He’s just like a magnet. Janice Iacona Ockershausen: No we went to the Basilica. Andy Ockershausen: Basilica to see the Pope. Monsignor Salvatore Criscuolo: When he canonized the saints. The canonization of the saints. Janice Iacona Ockershausen: Very exciting. Andy Ockershausen: He made such an impact on Our Town. Monsignor Salvatore Criscuolo: He really did and it’s so good to see the response from the people in Our Town. A positive response, and faith, and religion, and denomination did not play a part in it. Monsignor Salvatore Criscuolo: And the Holy Father, every body wanted to.. I started getting phone calls when it was announced in June, that he would be coming. And for the rest of the summer I had many many friends. Many friends. Andy Ockershausen: But that is St Patrick’s is the attraction. In Our Town. That’s a great tribute to you to make you Monsignor which means you’re in charge of that parish. Monsignor Salvatore Criscuolo: Right. As the pastor there. Andy Ockershausen: And that to me is so impressive. I love the old formation of that church. I love the old brick work the stone work it’s just a blessing. Monsignor Salvatore Criscuolo: The present church was built in 1885. So it goes back a few years. And doing my best to keep it up. It’s a historic church. It’s a church that’s visited by hundreds every week. And it’s an example and a beacon in Our Town to what it stands for. The doors are opened to all who want to come in for a visit. Andy Ockershausen: Well Father Sal, you’ve done a great job with it for a lot of reasons and I want to talk to you about the original Father Sal not with the, before you were ordained. This is Andy Ockershausen and this is Our Town and I will be right back. [Commercial] Tony Cibel: Hi,Tony Cibel here, to tell you about Tony and Joe’s and Nick’s Riverside Grill at Washington Harbour in Georgetown. Spectacular new restaurants. We’ve spent a lot of time rebuilding. You’ll love it, it’s really fantastic. For any information, you can go online to tonyandjoes.com. It’ll be a wonderful experience for the whole family. Call 202-944-4545 to make reservations. Everything is fabulous. You’ve gotta come down and have some wonderful food. Andy Ockershausen: This is Andy Ockershausen and this is Our Town. I’m having a wonderful lively conversation with the Reverend Monsignor Criscuolo. I’m gonna get that right yet Criscuolo. I’ll get it right with Father’s help. I’m going back before you are Father Cris, you were just a waif and you were born and raised in New Haven, Connecticut. Monsignor Salvatore Criscuolo: My sister Marie, yes. And my parents are now deceased and they gave both of us the foundation that we build on today. And still go back and still call Connecticut home. When I say I’m going to go home to see my sister. Andy Ockershausen: You have no accent Father. Monsignor Salvatore Criscuolo: None at all. Andy Ockershausen: Not to me. Do you agree with that Janny? He has no accent. Janice Iacona Ockershausen: Yeah. Little bit. Monsignor Salvatore Criscuolo: Little bit. Andy Ockershausen: We have relatives in Rhode Island, and as soon as you cross the border that’s different world. Monsignor Salvatore Criscuolo: That’s further North. It is. It is. Monsignor Salvatore Criscuolo: So I decided earlier on that I talked about becoming a priest and my parents were great about it. They were supportive but they were not over supportive. Andy Ockershausen: Was it when you were in high school you decided or..? Monsignor Salvatore Criscuolo: I talked about it a little bit in 8th grade and then through out high school. But in high school, I dated and I went to proms, and I went to sporting events and..
Monsignor Salvatore Criscuolo: Yes. Yes. When I graduated in 68, 1968. I went to my pastor and said I’d like to enter the seminary and he knew of the seminary down in Kentucky. And so I went down there and spent 4 years at St Mary’s and then from there I went to Mount St. Mary’s in Emmitsburg. Andy Ockershausen: Yeah wonderful wonderful school. Monsignor Salvatore Criscuolo: Beautiful place. Andy Ockershausen: Is that a Jesuit school? Monsignor Salvatore Criscuolo: No. No, it’s run by different priests from different orders and dioceses throughout the country. Andy Ockershausen: I know it’s a fabulous school in Emmitsburg. Monsignor Salvatore Criscuolo: And there I met a couple of the students who were studying for these diocese, and met their vocation director and talked to him Monsignor Curlin and decided I think I’d like to be ordained and be a priest in this area, and Monsignor Curlin. Andy Ockershausen: Is there competition for that particular location? Monsignor Salvatore Criscuolo: For a diocese? No there isn’t. In this day and age, most men will stay in their diocese, but in this particular diocese, in the Washington Archdiocese, the majority of the men are from some place else like the majority of the people in this town are from someplace else. A lot of the men have gone to school here. Catholic University, American University, Georgetown. Then got jobs and then decided you know I think I want to become a priest. But they’ve been in the area so this is the area. Andy Ockershausen: They’re comfortable right? Monsignor Salvatore Criscuolo: Very comfortable. It is an amazing area, wonderful town. I’ve had so many opportunities as a priest being in this diocese, that again, when I was ordained in 1978, I didn’t have a clue as to what I would be doing and it’s probably just as well because if I had a plan I’d probably would have messed it up. But God had the plan he doesn’t mess it up. No. Andy Ockershausen: The good Lord takes of you. Having all these opportunities you just thank the people that frequent your parish. The people of the world .. because it’s Washington DC. Monsignor Salvatore Criscuolo: Yes we get visitors from all over the world. We had, I had a couple last week from Australia. Indonesia. I mean it is every week they are coming to Washington to Our Town to visit it. Over twenty million visitors that come here every year. And thank God they find St Patrick’s. Andy Ockershausen: Father, I know what’s going on in the church now because we’re all citizens of it, and it’s important to us. These are things that happen overtime and they have their events or non-events and then that’ll disappear. That’s my estimation. As a layman. What ever the church is going through is not unusual the church has been through hard times in the past. But that will die down. The good Lord is gonna take care of us I’m sure of that. Monsignor Salvatore Criscuolo: The reason why the church is still here after 2000 years is because the good Lord founded the Church. He continues to guide the Church through the Holy Spirit. That’s why we’re still here. Andy Ockershausen: The good, the bad, and the ugly, and we’re all part of it. Father, do you have a career path? How long can you stay? Obviously you’re very active, you’re very involved, and so there’s no limit on time is that correct? Andy Ockershausen: You’re too important to Our Town. And I know you still help with the firefighters or First Responders. That’s new language with us. First Responders, well to me they were police and fire. But the First Responder sticks their necks out, I know that. Monsignor Salvatore Criscuolo: Every day. Every day, I have witnessed examples of heroism that go beyond my telling it. It’s amazing what these men and women will do. The only time in 32 years that I ever have seen fear on their face was on 911 when we were… in the city. Everything happened that morning and I got in that car, got into the city. Could not get around so I got on my motorcycle. Could get around. And up until from about 10 o’clock until 1:30 or so, every time a plane flew over, every body froze. And then everything was closed down but during that..
Andy Ockershausen: Amazing experience for you. Was it not? Monsignor Salvatore Criscuolo: Yeah I saw those men and women who couldn’t do anything but were still out there just in case something did happen. Andy Ockershausen: It’s a great experience for our country. First time we’ve been attacked ever. But, the First Responders came through. They all worked at the Pentagon I know that story very well and I know what your Parish did and the rest was so important. A visual. People saw the police and fire and they felt better. Monsignor Salvatore Criscuolo: And the only people basically in town after a few hours were the visitors. Andy Ockershausen: I know that they were trapped. Monsignor Salvatore Criscuolo: The tourists could not get out. Everybody that lived and worked here, they were able to get out by about 2 o’clock or so, 3 o’clock. It was literally a ghost town with First Responders. Andy Ockershausen: You’re preaching to the choir .. I happened to get caught at the Army Navy Country Club but I got home. I went through Our Town, I went through alleys and places I didn’t even know existed. But that was a scary moment. ‘cus you didn’t know what else was gonna happen. Monsignor Salvatore Criscuolo: And that’s the only time that I ever experienced fear on their faces. Andy Ockershausen: Well hope our country got a lesson out of it, Father. Advertisement: I sure hope so. Andy Ockershausen: But this has been so great to spend time with you. You’re absolutely a legend. . I know you don’t like to hear that.. but your too young to be anything but a real legend. A legend and for what you do for Our Town we are so grateful. Monsignor Salvatore Criscuolo: Well Andy I thank you. It’s been a pleasure and a privilege being here today, and what the people do for me is also amazing. They give so much back to me through their examples, through their faith, through their strength, and their courage. I come out on top. Andy Ockershausen: Well we preach that, Father, the more you give the more you get back. Monsignor Salvatore Criscuolo: It’s the truth. 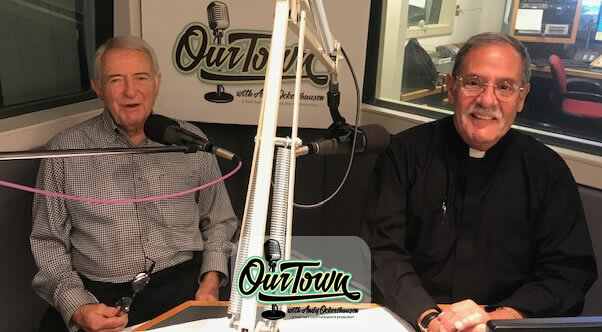 Andy Ockershausen: This is Our Town with Andy Ockershausen and Father Sal I still like to call you Father Sal. Monsignor Salvatore Criscuolo: Then call me Father Sal. Andy Ockershausen: .. and you’re the man. Thank you so much for all you do, and you do a lot. We appreciate it. Andy Ockershausen: You’ve been listening to Our Town season 4, presented by GEICO our home town favorite with your host Andy Ockershausen. New Our Town episodes are released each Tuesday and Thursday. Drop us a line with your comments or suggestions. See us on Facebook or visit our website at ourtowndc.com. Our special thanks to King Hunter our Technical Director and WMAL radio in Washington DC and thanks to GEICO. 15 minutes can save you 15% or more on car insurance.